Our colour palettes and planting schemes are devised using both the foliage and the flowers of the selected plants together, producing a unifying but fluid visual theme throughout the year. When designing a gothic garden it will help to bear in mind what creates a great gothic garden. Spooky details, like moss-covered tombstones or statuary, along with flower and foliage color geared towards the dark, creepy side of gardening is exactly what you need. Of course, you also have the option of filling your goth garden with ancient herbs and plants that have a popular past, especially those surrounded by legends and lore. Necrotic colored plants are another possibility, as death would certainly be considered appropriate in a dark, gloomy gothic setting. 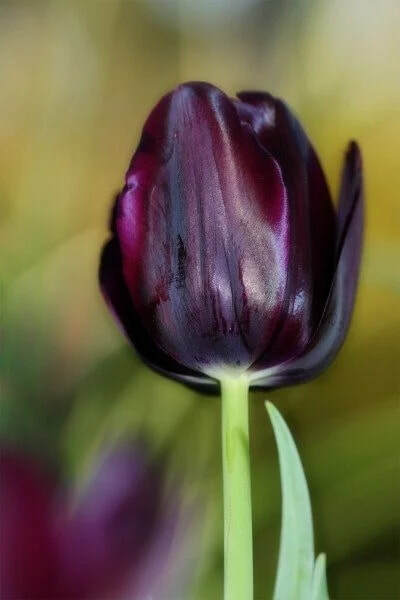 Choose flower colors that are deep purple, dark scarlet red and nearly black as found in black garden themes. In addition, plants with dark foliage can create a gothic feel. 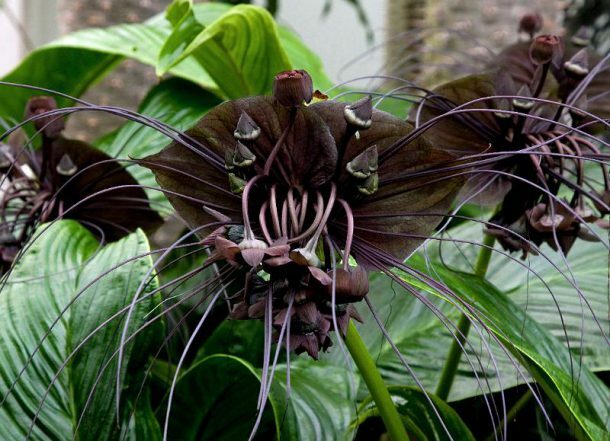 And don’t forget those creepy plants—you know, the ones that eat insects, smell bad, have strange names or are just plain weird. There are many types of carnivorous plants that can be placed in a bog-like niche within the gothic scenery. Growing your own Victorian black garden is not hard at all. It’s basically done just like any other garden. Careful planning always helps beforehand. One of the most important factors is proper positioning. Dark-colored plants need to be placed in sunny areas to prevent them from becoming lost in the dark corners of the landscape. They should also be placed against a lighter backdrop in order to stand out more effectively. 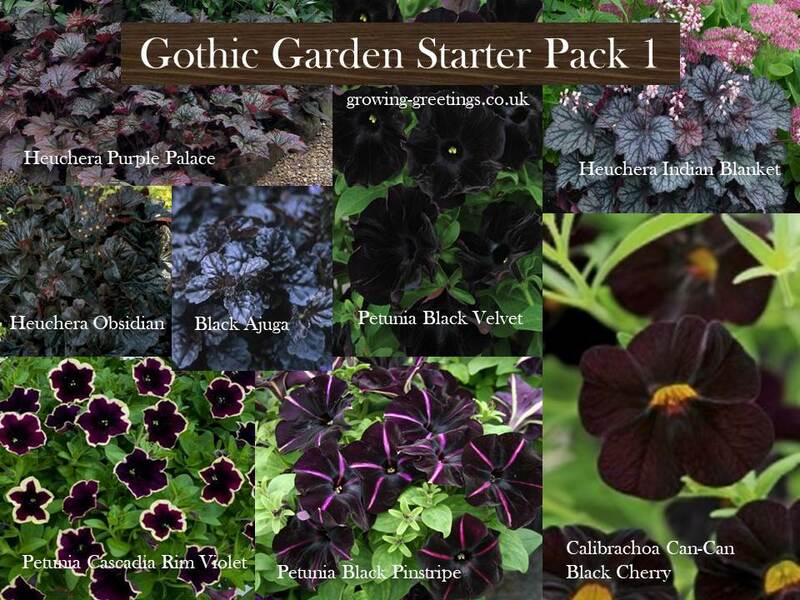 Gothic Gardens Starter Packs! New for Spring 2019! Get a head start of a beautiful garden for 2019 with our convenient starter pack! 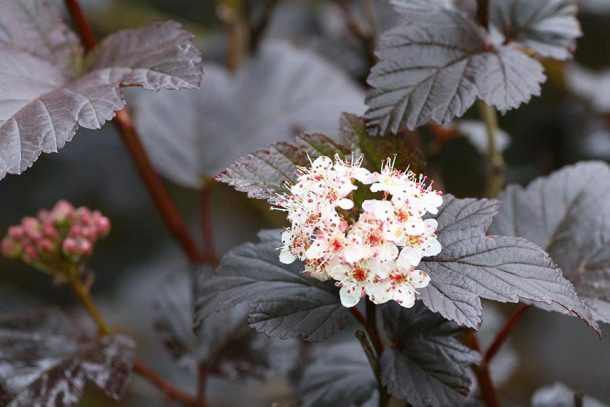 The Pack includes 8 Carefully selected plants (shown Above) with either black foliage or flowers. All the plants should adapt well to a range of garden conditions with the foliage plants being suited to both shady and open garden areas and the flowering plants working well in both containers and flower beds. Each starter pack comes with one of our fabulous concrete skulls in either small or large sizes. Any of the foliage or flower plug plants supplied in the plant packs will work great planted in your skull as either bushy hair or trailing locks. We also offer our skulls and plug plants for sale individually and these will be listed for sale during Feb 2019 ready for Spring. Moon Shadow. This garden was designed for a client using textures and colours of Universe designs . A night sky with vivid flashes of colour. Another aspect of the black garden is learning how to use the various tones and hues correctly. While black plants mix rather easily with other colors, some work better than others. The best thing to keep in mind when working with black palettes is choosing lighter shades that will contrast well with the black-colored plants you’ve chosen. This will actually help intensify their color and allow them to stand out easily. Black flowers/foliage can accentuate other colors if carefully placed. For instance, black plants work well when combined with silver, gold, or bright-colored tones. 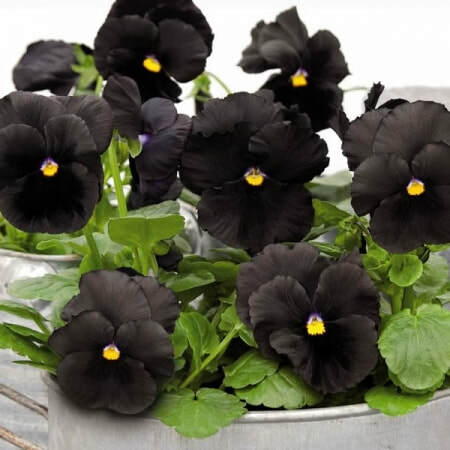 In addition, keep in mind that when choosing black flowers for the garden, some may actually appear dark purple or red rather than pure black. Plant color is also likely to change depending on location and other factors, such as soil pH. Black plants may also require additional watering as their darker shades can make them more susceptible to withering from the hot sun. Black Flowers for the Garden When using black plants for the garden, consider their various textures and forms. Look for different types of plants with similar growing requirements.